It's interesting to see how trends seem to hone in on one person that becomes the locus of most of the attention around a subject. 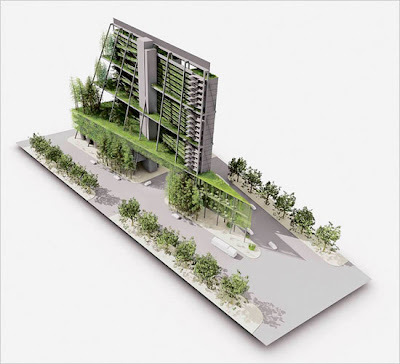 Patrick Blanc and vertical gardens, Fritz Haeg with the 'revolutionary' idea of tearing up the lawn and planting vegetables, Michale Pollan and well, everything related to food - and now Dickson Despommier - who seems to be the media darling around the idea of Vertical Farming. The NY Times featured another article around this idea, positing: "What if “eating local” in Shanghai or New York meant getting your fresh produce from five blocks away? 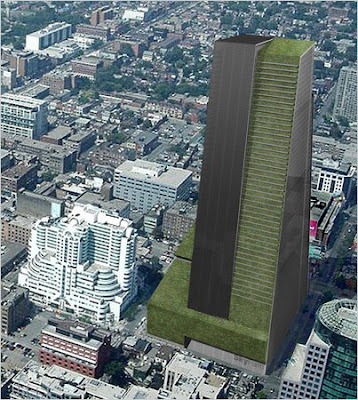 And what if skyscrapers grew off the grid, as verdant, self-sustaining towers where city slickers cultivated their own food?" 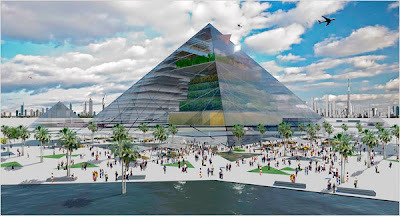 And some technical support: "He says his ideas are supported by hydroponic vegetable research done by NASA and are made more feasible by the potential to use sun, wind and wastewater as energy sources." 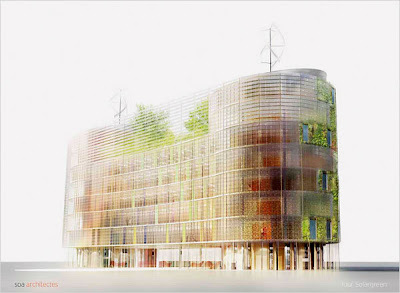 An interesting example via the article is from Seattle firm Mithun, who's Living Building Challenge winning entry: "...a small-scale vertical farm design for a Center for Urban Agriculture in downtown Seattle. 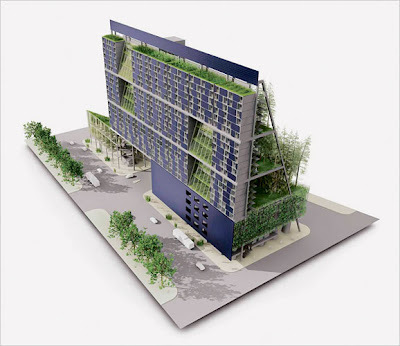 The design won an award in the Living Building Challenge of the Cascadia Region's chapter of the U.S. Green Building Council in 2007... 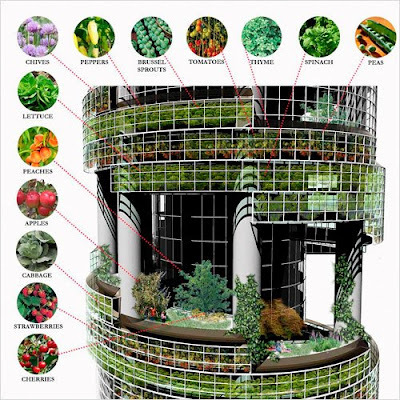 The Mithun vertical farm design differs from Dr. Despommier's high-rise concept, but has piqued the interest of officials in Portland, Ore. "It was pushing the envelope as to how people might live sustainably in the future," said Bonnie Duncan of Mithun." This is a very cool example and one that has been featured locally in the Seattle DJC in May. Not sure exactly how this 'piqued' the interest of Portland officials, as we've been talking about rooftop ag. here for a while (the first I remember was 2001, where there was talk of taking an abandoned helipad atop a parking structure and converting it to a community garden ... but whatever. 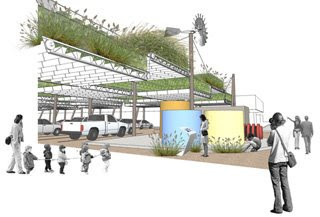 Another interesting competiton winner from a Seattle firm is Bumper Crop (again via the Seattle DJC), an interesting agricultural intervention from MillerHull Partnership, featuring: "...movable aeroponic plant trays shade parking and reduce the heat island effect at a Scottsdale strip mall. Biofuel and textile-quality plants take irrigation from a treated city sewer line. Rainwater capture waters plants that could be harvested on-site at a lot-side farmer’s market." 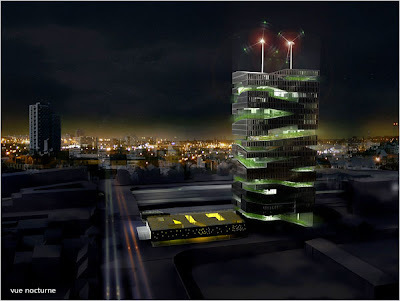 But just don't forget the one name for Vertical Farms - and that's Despommier. Dickson Despommier. These are the best solutions I've seen to eating locally. It's nice to see people thinking about these issues.